These days, Android powers more than smartphones. You can find it on media streaming devices, set-top boxes, and smart TVs as well. For Kodi users, this is good news as it means that you can run this application on a wide variety of devices. And also, the good news is that you can install Kodi on Android in a matter of minutes. We’ve updated our guide on how to install Kodi 18 on Android phone and TV in 2019, as our intention is to cover as many device types as possible. With this said, let’s first take a look at the official requirements to make sure you can run Kodi with no issues. The latest official Kodi version requires Android 5.0 or higher. Kodi also requires x86 (Intel) or NEON-compatible ARM processor. This is especially important for those of you who want to run Android on tablets and TV boxes. The majority of Kodi addons offer HD content. To fully enjoy this kind of content, you need a fast Internet connection as well as a screen that supports High Definition resolutions. The majority of newer Android devices meet both of these features successfully. Before we tell you all about installing Kodi on Android, we’ll provide a nice way to jump between different installation methods. So, here’s what to expect from this article. First, we’ll go with the easiest and fastest method. Here’s how to install Kodi on Android by using your device’s Play Store. Using your smartphone or tablet, open the Google Play Store. 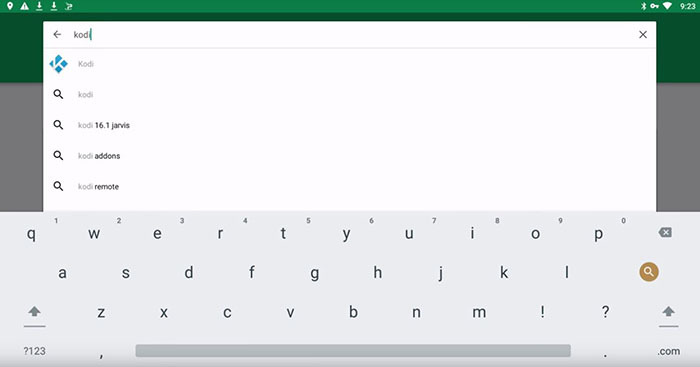 At the top of the screen, you’ll see a Search Bar. Tap on it and type in ‘Kodi’. After a couple of seconds, Kodi will be shown among the search results. You’ll notice that a number of applications will be present, but only one is the official one: Kodi, created by the XBMC Foundation. Click on the app’s icon. What you should see now is the app’s overview. This is also where you’ll find the Install button. Use it. After a while, Kodi will be downloaded and installed. You can use the same screen to launch the app, or you can go to your device’s app drawer. That’s it! As you can easily, it’s incredibly simple to install Kodi on Android. Continue reading to find out about another installation method. 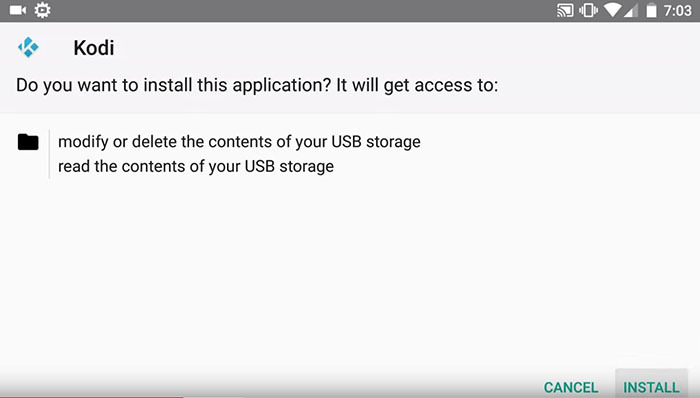 Next, let’s talk about how to install Kodi on Android by using Google’s Chrome browser. Open Chrome (or any other device) and navigate to https://kodi.tv/download. Scroll down on the website until you see a section named ‘Choose Your Weapon’. This is where you’ll see the Android logo. Click on it. A new screen will open. You will see three blue-colored buttons. We only need two of those, named ‘ARMV7A (32bit)’ or ‘ARMV8A (64bit)’. As we said earlier, you need to find out what kind of processor powers your device. If it’s a newer device, you can go with the 64bit version. After you’ve clicked on the correct version, the file will begin to download. You will see an active notification on your device, which will also inform you when the download ends. Now we need to install Kodi. Click on the notification that says that the file has been saved and you’ll be taken to your device’s File Explorer. Click on the app’s icon and you’ll enter the Installation Screen. Click ‘Next’ a couple of times, and Kodi will go through the rest of installation on its own. You’ve made it! After the installation ends, Kodi will be placed among your smartphone’s apps. Find it, and click on it to launch Kodi. Now, let’s talk about installing Kodi on your TV. 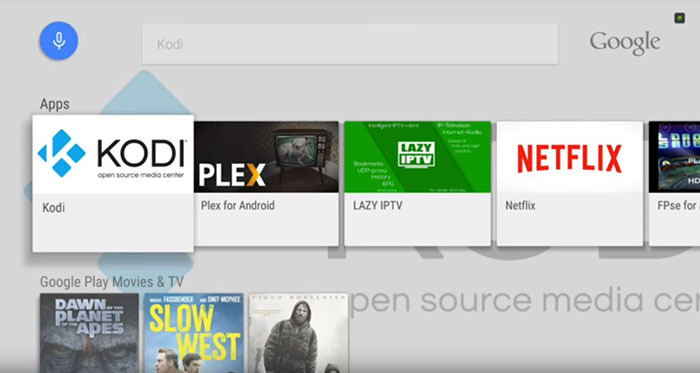 Here’s how to install Kodi on Android TV by using the built-in Play Store. Launch Android TV and you should see its Home Screen. It consists of rows of icons. You can find Kodi by opening the Google Play Store. Alternatively, you can use the voice search function and simply say ‘Kodi’. After a couple of seconds, you’ll see this application listed as one of the available options. No matter what method you use, click on the app’s icon. What you should be seeing now is Kodi’s overview. Use the Install button to finish the procedure. Kodi’s installation file will begin to download. After a few minutes (depending on your Internet connection), Kodi should be ready for use. 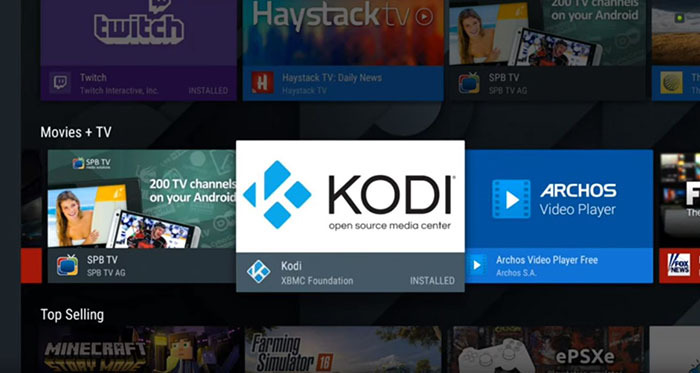 You will be able to find Kodi in the Apps Section on Android TV. Lastly, here’s how to install Kodi on Android TV if you have Google Chrome (or any other Web browser) installed. Open Chrome and go to http://kodi.tv/download. This is where you’ll find a list of available Kodi installation files. 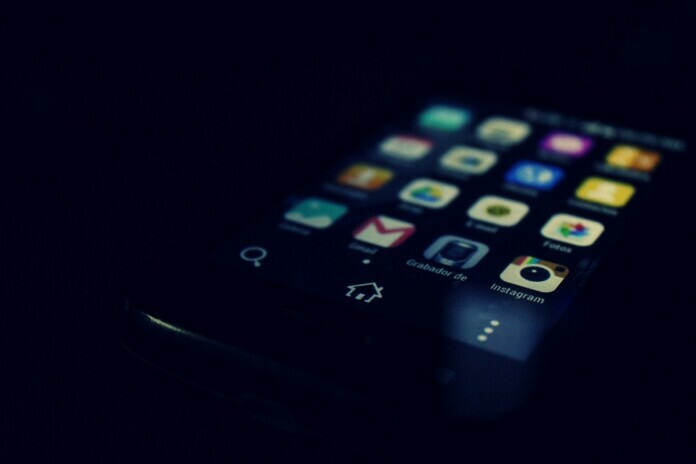 You’ll recognize Android’s icon among the available selection. Click on it. Among the available options, you should pay attention to two of them: ‘ARMV7A (32bit)’ or ‘ARMV8A (64bit)’. Their only difference is in their compatibility with different processors. The majority of Android TV devices and TV boxes are powered by 64bit processors. You should try that option first. If it fails to install, return and download the 32bit version. As the file begins to download, you will see a live notification. It will transform into a ‘Download Completed’ notification after the file downloads. Click on it and your device’s File Browser will open. Find your newly downloaded file and click on it. You will see the Install button. Click on this button. After a short installation guide, Kodi will be installed to your device. Find it in the Apps Section and launch it. We want to use this opportunity to teach you a few additional things about Kodi. This is why we’ve come up with a set of helpful guides found on TechNadu. Make sure to check them out. So, that would be all on how to install Kodi on Android. We hope that you’ve found this installation guide to be helpful and that now you have Kodi up-and-running on your device. If you have something to share, don’t hesitate to use the comments section below. We’d love to hear your opinion. And also, don’t forget to follow TechNadu on Facebook and Twitter. Thanks!